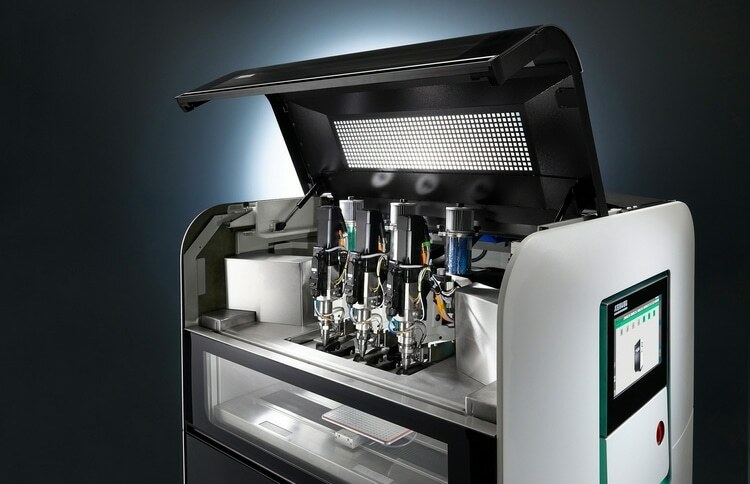 Arburg will present its large Freeformer 300-3X for the first time in America: The new machine for industrial additive manufacturing can be seen from 21 to 23 May 2019 at Rapid + TCT in Detroit (Michigan, USA). At the trade fair stand in hall C, stand 1253, a Freeformer 300-3X will produce resilient gripper fingers in a hard/soft combination made of ABS, TPE and support material. A Freeformer 200-3X will also produce a part with honeycomb structures from an FDA-approved original TPE. The capabilities of Arburg Plastic Freeforming (APF) will be demonstrated by numerous functional components and at two interactive stations. "We will be demonstrating the great progress we have made in Arburg Plastic Freeforming (APF) at Rapid + TCT. 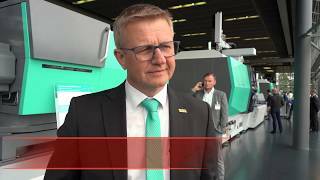 Our highlight is the Freeformer 300-3X - the world's first machine capable of additively manufacturing resilient hard/soft combinations with support structure from three components", emphasises Lukas Pawelczyk, Department Manager Sales Freeformer at Arburg. "With our know-how in plastics processing and the two Freeformers in sizes 200-3X and 300-3X, we offer attractive solutions to experts and newcomers for industrial additive manufacturing. The great advantage of the APF process is the ability to use qualified plastic granulates. Customers can therefore process the same original materials they would use in injection moulding and from this additively manufacture components with similar mechanical properties. This is particularly interesting for medical technology. The Freeformer is also in great demand for processing thermoplastic elastomers." The Freeformer 300-3X with three discharge units opens up a host of completely new applications. It is capable of additively manufacturing complex and resilient functional components in hard/soft combinations, made from two qualified plastics plus support material - which is unique in the industry. The exhibit at Rapid + TCT 2019 will produce movable gripper fingers made of ABS, TPE and support material - in a single step and without requiring additional assembly effort. 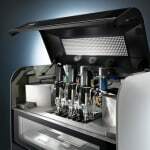 The new Freeformer 300-3X features three discharge units and a divided build chamber door. It is designed for industrial additive manufacturing and is suitable for automated use in production lines. The designation 300 stands for the available platform surface area in square centimetres. This is just under 50 percent larger than on the proven Freeformer 200-3X. The build chamber of the large Freeformer offers space for larger small-volume batches and parts with dimensions of up to 234 x 134 x 230 millimetres. "3X" stands for the moving axes of the part carrier in the x, y and z directions. A closed cooling system with an industrial cooling water connection is available as an option. This will enable materials to be processed at high build chamber temperatures of up to 200 degrees Celsius in the future. The two-piece build chamber door is another new feature and allows, for example, that the feed hoppers can be refilled during ongoing operation by opening the top half of the door. The heated build chamber now only needs to be opened for inserting the part platform and removing the finished parts. Due to the automatic opening and closing function of the build chamber door, the Freeformer 300-3X can be integrated in IT-networked production lines. With its Freeformers in sizes 300-3X and 200-3X, Arburg covers a broad spectrum for industrial additive manufacturing. The APF process is particularly suitable for industrial additive manufacturing of functional components. This includes individual plastic parts for consumer goods, spare parts made of original materials and implants for medical technology. FDA-approved TPE-S (Medalist MD 12130H) with Shore A hardness 32 can only be processed on the Freeformer. In Detroit, a Freeformer 200-3X with two discharge units will process the material to produce components with honeycomb structures that could be used for lightweight construction or as filter elements, for example. Trade visitors to Rapid + TCT 2019 can also gain an impression of the capabilities of the Freeformer exhibits based on numerous functional parts. Exhibited parts will include cable clips made from PP, transparent test discs made from PMMA and bellows made from elastic TPE. Two interactive stations will be available where trade visitors can test the functionality and durability of selected functional parts for themselves. These will include a very thin and elastic "spider membrane" made of medical TPE-S, screw caps made of PP and skull implants made of resorbable PLLA. 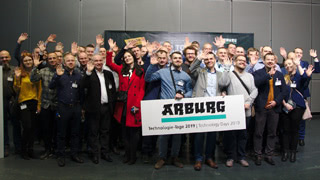 In the Arburg Prototyping Center (APC) at the German headquarters in Lossburg, a number of Freeformers produce benchmark parts for prospective customers. Preliminary trials are conducted to determine whether the technology is actually suitable for the desired part, material and application. Further machines are used for the same purpose at the company's subsidiaries across the world, including in the USA.